Let’s face it. We’re spoiled. From waterfronts to national parks, there’s so much beauty to be found in the greater Cleveland area. We asked you your favorites and we were overwhelmed with the responses. So without further ado, here is our list, some well known and some hidden gems, some in the heart of downtown and some off the beaten path. A gem on the east side. One of the best places to watch the seasons change or see local wildlife, Sunset Pond at North Chagrin Reservation is easily accessible to our friends east of the city. Now for our friends on the west side, The reservation spans 8 west side Cleveland cities along the Rocky River. Take in all the views, from water and wildlife to cliffs and forests. All that Cleveland has to offer, in one place. When you find yourself downtown for a run, the waterfront at North Coast Harbor gives you Cleveland’s “coastal” vibe. Just get yourself to the E 9th Pier. You’ll see. Whether you’re looking out onto Lake Erie or taking in the Rock Hall and the William G Mather, it’s a place to get out of the hustle and bustle of downtown life. “Cleveland’s not REALLY a city.” We beg to differ. Just take the naysayers to the soltice steps at Lakewood Park and show them an outsiders view of Cleveland. It’s a beautiful view of downtown at virtually any time of day. This beautiful shot comes from the path that follows Lake Erie on the east side of downtown. If you haven’t taken yourself to the lake in the AM hours, it’s something else. Catch the sunrise and boats leaving the marina before the city wakes up. We can’t talk about views and leave out the fact that Cleveland is situated next to a national park. 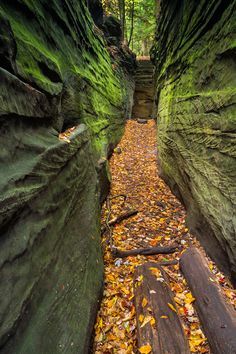 The Ledges at the Cuyahoga Valley National Park are a crowd favorite. The view from above, below and inside are equally extraordinary and the running ranges from easy to technical trails. A unique wildlife haven on the shore and in the city. Not only an opportunity to take in Cleveland wildlife, but if you find yourself at the edge of the bird sanctuary you can just make out a view of downtown over the water. One of our off the beaten bath views. You’ll find this trailhead where the Buckeye Trail and Towpath meet secluded from roadways. The views here are literally countless (it hurt us to pick just one), and this section of trail is also uniquely home to nesting bald eagles. The most iconic view for Clevelanders. Any view from one of the downtown Cleveland bridges let’s you take in the city in its entirety. Whether you live downtown or not, it’s a must on the Cleveland runner’s bucket list.